A surgical gel - containing a drug untested on humans - has caused excruciating internal scarring in dozens of women that could lead to infertility, claims a leading gynaecologist. Medsafe, the Government agency that approves medicines, has told the American manufacturer to add additional precautions to the instruction pamphlet. But it maintains the product is safe, and refuses to ban its sale without conclusive evidence of harm - even though the gel is considered high risk under proposed legislation. Dr Koya - who first raised concerns in December 2005 - was disillusioned at the response of health agencies, which she claimed had let Confluent SprayGel be used internally on thousands of Kiwi women since about 2002 without adequate clinical testing or ongoing monitoring of its effects. "Confluent SprayGel is a product sprayed inside human beings and contains a section 29 drug (methylene blue) which has not been tested on human beings, and this product was allowed to be used ... [with] no quality assurance in terms of monitoring," she wrote to Medsafe in December. "It's quite amazing - we're using it inside human beings," she told The Dominion Post. "I would have expected ... that they would have said, `Let's put this product on hold or start asking some questions', but that didn't happen." 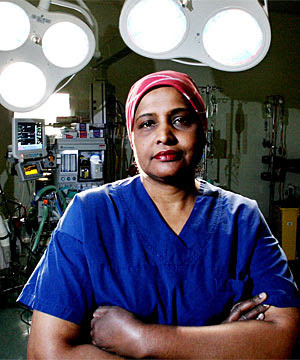 Dr Koya began using the gel in October 2002, but stopped in April 2006 after her rate of repeat laparoscopies - keyhole operations - jumped from less than 2 per cent to around 10 per cent. Women who would usually have made swift recoveries developed severe pain or discomfort after their initial operations. Dozens of the many hundred women she treated with the gel needed repeat surgery to remove scarring - which could cause infertility - even though their endometriosis had not returned. "It's only where I've sprayed the SprayGel. It's like sheets of scarring which I've never seen in my practice." Medsafe interim manager Stewart Jessamine said SprayGel was classed as a device under the Medicines Act, not a medicine. No clinical assessment was required before its sale, though manufacturers had to ensure the device was safe. Medical practitioners had the ultimate responsibility for its use on patients. After a review, it it concluded the gel was safe "when used as intended". As IHRT contemplates the desperation of consumers to have adhesion barriers provided in their surgeries and industries willingness to provide them, we are disheartened. Patients aware of adhesion barriers or indeed adhesions are a slim minority. As we reflect on this headline, one wonders where this number comes from? IHRT then looks at the source of this press release. IRONICALLY, Millennium Research Group is based in Waltham, MA, home of Confluent SprayGel! If an effective adhesion barrier were found and put into use….the number would be enormous!Here is an example of a guess on what that number might truly be. Take the history of Spraygel to it’s current incarnation as SprayShield TM. All IHRT can think to say is, “return on investment”. Here is an example to see. Tuesday, October 28, 2008Falling apart over OmrixWhen I added Omrix Biopharmaceuticals Ltd. (Nasdaq:OMRI) to my portfolio, tracked by "Globes", I noted that it was a profitable biotechnological company in a most interesting niche - biosurgical sealants for the prevention of hemostasis in surgery - and that it was not an all or nothing company, like Pharmos Corp. (Nasdaq: PARSD), for example, where one failed trial can wipe almost an entire investment. The founder of Confluent Surgical knew his product would not pass FDA standards so the product was taken out of clinical trials….Somehow, with fraudulent information SprayGel got it’s CE mark and was used throughout the world as an anti-adhesion barrier. Those in the United States remained safe. IHRT was founded by the victims of ongoing study of Spraygel until we realized we were being experimented on and paying for the pleasure. In of all places Germany! The gig was up and Confluent was sold to Tyco which was then sold to Covidien. As IHRT continues to watch Covidiens stocks fall we become more concerned about them seeking a quick return on their investment! It looks like Covidien may have learned to save money by moving it all offshore just as Confluent did. Is it the old lets see if it works ON THEM and then go to the FDA? The same scenario is happening again with of all people, Kruschinski and Mettler. In of all places Germany! Kruschinski D, Homburg S, D’Souza F, Campbell P, Reich H.Adhesiolysis in severe and reccurent cases of adhesions relateddisorder (ARD) - a novel approach utilizing lift (gasless)laparoscopy and SprayGel™ adhesion barrier. Surg Technol Int.2006;15:131-9. It is IHRT’s opinion that until there are actually surgeons learned enough to perform an adhesiolysis that needs no barrier, these products are just a panacea…Skill is what’s needed and compensation for the time it takes to perform a successful adhesiolyis. Until then we fell everyone’s just kidding themselves and no product can compensate for, quick or ultra conservative surgery. So think hard and do your research, be careful of patients who claim this is the best or only way. How many doctors (surgeons) encourage those who are sick to contact his former patients? No doubt, Dr. Kruschinski has raised the bar of excellence when it comes to "treating" a patient. See: Patient ListThanks Dr. Kruschinski. Our daughter has regained her life due to your brilliance, commitment and compassion for those who suffer from this dread disorder. This is what IHRT calls “Harvesting” a dreadful practice that can lead a person to an unwanted intervention. 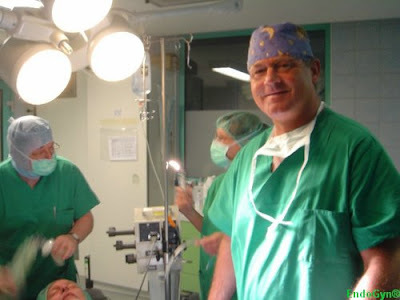 COVIDIEN EXPOSES DR. DANIEL KRUSCHINSKI - GERMANY - OF PERFORMING EXPERIMENTAL SURGICAL PROCEDURES ON UNSUSPECTING HUMANS - MANY PATIENTS WERE FROM THE UNITED STATES! COVIDIEN is an International provider of medical devices, supplies and pharmaceuticals. Dr. Daniel Marian Kruschinski - a Polish surgeon was performing experimental operations in Germany on patients from the United States......has stated on numourouse occasions that his father was in Auschwitz concentration camp during WWII and he learned his methods from him! "These adhesion patients are sufferring no matter what I do to them, so I do operations on them to see what outcomes will be!" said Kruschiski! Self proclaimed: Head of the Endoscopic Gynecology Centers in Germany. EndoGyn pursues the idea of Novel and progressive treatment modalities of gynecological endoscopy. 18 years experience and more than 5000 operations behind him and with the greatest experience worldwide and, at international level. "Kruschinski et al. (2006) evaluated the efficacy of SprayGel™ in preventing adhesion reformation during adhesiolysis procedures in patients with adhesion related disorder. ALL of the patients from the United States were unsuspecting "human experiments" and were charged for their surgeries, paying Dr. Kruschinski thousands of US dollars. A number of these patients returned for multiple operations by Dr. Kruschinski, and again paid thousands of dollars for what is now recognized as unauthorized medical experiments. * Patients from the United States listed below in this post! Not only did Dr. Kruschinski perform these operations without the knowledge of the German Medical Board, he violated the German Laws & Ethics governing "clinical trials" in that country, which parallels the "Ethics and Laws" of clinical studies in the USA! * See reports below in this post! Kruschinski never related to his patients that his "Adhesiolysis procedures with Spraygel" was of an "experimental basis!" Dr. Kruschnsi made claims that no re-formed or Denovo adhesion formation was found at second look procedures! He claimed over and over that patients undergoing his "gas less adhesiolysis procedure" were 100% adhesion free at SLL, he even validated those claims by posting pictures of the SLL results of these patients!" 89.3% reduction in severity, and 89.9% reduction in grade). Five patients (14.3%) had a third-look laparoscopy within 6months of the initial surgery, in which four cases of adhesion reformation were confirmed." If YOU had an "Adhesiolysis with Spraygel" in Germany under the scalpel of Dr. Daniel Kruschinski, you were a human experiment, and if you are currently presenting with abdominal/pelvic pain, it is more then probable that your pain and suffering is from adhesions! Contacts for the "Germany Agencies" governing clinical trials in Germany, and "Government Agencies" currently involved with investigations of Dr. Daniel M. Kruschinski will be Posted Soon on IHRT! IHRT encourages all patients to Dr. Kruschinski to also contact "Covidien" and request the "Abstracts" from the "Endogyn SprayGel Adhesiolysis" clinical studies performed by Dr. Daniel Kruschinski as represented in the Covidien web site! * See contacts below in this post! It appears that Covidien is currently involved in a similar scam with Dr. Kruschinski as he makes claims in his web site that he is currently doing the clinical trials for Covidien and the SprayShield, though there is no record of these clinical trials being authorized by the German Government for Kruschinski to be involved in them. Once again we see that Kruschinski is using unethical and "novel" means of sharing the "Covidien SprayShield" clinical trials results by using his web site "message board!" It is all to apparent to IHRT that Daniel Kruschinski is once again perpetrating crimes against humanity as he performs "experimental" operations with the "Covidien SprayShield Adhesion Barrier" on unsuspecting vulnerable patients once again! Covidien appears to be sanctioning these studies by not denying their association with Endogyn and Dr. Daniel Kruschinski when contacted by IHRT representatives. PURPOSE: Similar to the registration process for pharmaceutical agents, medical devices have to undergo standardized clinical evaluation before being marketed and used in routine therapy or diagnostics. However, conduction, submission, and reporting of such clinical evaluations to authorities has to follow the German law on medical products(Medizinproduktegesetz,MPG), which in some central aspects differs remarkably from the German law on pharmaceuticals (Arzneimittelgesetz,AMG). METHODS: Relevant deviations of MPG requirements from those of the AMG are reviewed with particular emphasis on submission, conduction, and reporting of trials to the authorities in charge. RESULTS: Whereas AMG-based trials focus on the proof of efficacy of pharmaceutical agents, the MPG demands instead proof of functionality of the medical devices; the MPG therefore concentrates more on technically satisfactory results in the context of function and patient safety. The aim of MPG trials is thus CE marking instead of AMG-based registration. However, this focus on functionality implies that medical devices need not necessarily be tested in a clinical trial--in some settings evidence-based evaluation alone will be sufficient. The decision on the necessity of a clinical trial is based mainly on the risk profile and invasive character of the device at hand. Med Klin (Munich). 2000 May;95(1 Spec No):15-7. Abteilung für Klinische Pharmakologie der Medizinischen Fakultät, Rheinische Friedrich-Wilhelms-Universität Bonn. Increasing numbers of clinical research projects are submitted to ethical committees (institutional review boards) for approval. New therapeutic developments have to be evaluated by these committees to protect patients/volunteers. Thus, the responsibility of ethical committees is increasing. The "Nürnberger Kodex" and the "Declaration of Helsinki" are the background for these evaluations. According to the German drug law the physician is obligated by law to submit the protocol to such a committee. In addition, local state physician authorities require such a procedure. Important considerations during the review process besides ethical aspects are the informed consent, which should be written in an understandable form, and the obligations of the insurance. Comparison of German and American law concerning clinical trials. In German and American law, clinical trials require a positive benefit-risk evaluation, free and informed consent, medical and scientific qualification of the doctor, and a written research protocol. American law requires a written consent, which is free of undue influence, the subject being instructed that he is free to withdraw from the trial. In German law, an orally given consent is sufficient for therapeutic trials. With minor or incompetent research subjects, informed consent to therapeutic clinical experimentation has to be given by their parents or guardians, the permissibility of which, in other trials, is controversial. In non-therapeutic trials, blind studies, double-bind studies, and trials involving placebos, special attention has to be paid to the risk-benefit analysis and to informed consent, which in these cases, even in Germany, must be written. The most outstanding feature of American law of clinical trial is that the experimentation is subject to previous control and approval by institutional review boards. The most interesting difference in German law is the investigator's duty to effect an insurance against the risks of the research subject's death or invalidity. Information presented on Clinical Trials Search isn't designed to be a substitute for proven medical advice, travels to or treatment with a real mD. We are not doctors. Always consult your local Germany physician on conditions. Clinical Trials Search.org is a website dedicated to listing clinical research studies in human subjects. Germany Clinical research trials and Germany health trials occur in hundreds of Germany localities. A clinical trial or clinical study is a research project with human volunteer subjects. Clinical drug trials and pharmaceutical clinical trials generally assess the effectiveness of new does drugs. The purpose of the studies / undertakings is to figure out particular human medical questions. Clinical trials are a popular manner for mDs, government agencies, and private sector companies to locate remedies for all kinds of conditions. Germany Clinical Trials and other clinical trials permit volunteers to access medical treatment options before they are available to the masses. Most times the human subjects receive treatment for without cost, and every now and again they are compensated for their time. Test subjects oftentimes obtain the best healthcare available for their condition. Risks are a reality, nonetheless, and can include extra or frequent physician calls, health hazards (potentially life-threatening), and/or the treatment being ineffective. Trials are federally regulated with rigorous guidelines to protect clinical trials patients. (This list is in part as many patients to Endogyn refused to have thier names made public. All the patients listed here gave permission for their contact information to be accessed via the Internet. Stay tuned to IHRT as we await news that will rock your world. How desperate is Kruschinski and how desperate are Patients! Kruschinski has traps that I guess we can coin as credibility traps where the unsuspecting might actually believe his garbage! IHRT has been assured that the Karl Storz Co. has stopped manufacturing and sales of the AbdoLift long ago. Besides, IHRT tipped off a klinik that Kruschinsi and gasless was a con and he hi tailed it out of there so quick he left his abdolift there with a bunch of unopened mail! Bills we believe. This klinik is ever grateful to the vigiliant IHRT team! Hello, I appreciate you reading my post. I am a 35 year old female in need of surgery to remove pelvic adhesions. Adhesions are scar tissue, or bands of fibrous tissues that bind your organs together (bowel to ovary or stomach to intestine, for example) so that your organs cannot move independently as they are designed to do. My adhesions cause pain- everyday. We suspect they are causing infertility (based on findings during prior surgery) and we are scheduled to do a dye test to confirm this. I have been married for 3 years, so this was a particularly sad piece of news. My adhesions are pulling on my organs causing a constant spasm cycle that is extremely difficult, if not impossible to break as long as adhesions are present. Plain and simple-I hurt. Every day. Removal of adhesions or, adhesiolysis (ad-hee-zee-oh-lye-sis) is both the treatment and the cause of the disease! Yes, you read that right. Removal of adhesions through surgery only makes them worse! When you cut away the fibrous bands of tissue, more scarring forms and the adhesions return, binding your organs- most often worse then before! This can affect ANYONE who has surgery! This I know first hand as my first surgery to remove adhesions has only caused me more pain.I have insurance, but they will not pay for the surgery. Let me explain. In the USA, adhesions are generally removed through laparoscopy which is done by inflating the patient's abdomen with CO2 gas then inserting tiny instruments into the abdomen to cut or burn the tissue away from the organs. Often times, doctors will fill the abdomen post-adhesiolysis with a saline solution in order to try to prevent adhesions from reforming. This is exactly how my last surgery was performed. There are 2 issues with this entire approach: 1. Studies show that the use of CO2 gas acidifies the abdomen thereby creating the ideal environment for adhesions to grow! 2. The saline solution is completely ineffective in preventing adhesions from growing. The tender tissues (that have just been cut or burned) are raw and ready to sprout more scars. It is a vicious cycle. This is COMMON knowledge amongst the medical community and I have been told that having another surgery to relieve my pain is not a good idea since I will likely only get worse. In despair, I created an Adhesion Group discussion board and met a woman who found a doctor in Germany who is using a different approach to removing adhesions. Her daughter was violently ill and repeatedly misdiagnosed for 13 years and then they found this doctor and an answer. I have been in contact with about a dozen of US residents who have been pain free for 5+ years since having this procedure. It works!Instead of using CO2 to inflate the belly, the doctor uses a procedure called Abdolift. It is basically a mechanical way to look inside the body which sidesteps creating an acidic "adhesion encouraging" environment. The gasless method also prevents the typical post surgical pain associated with CO2 in your belly- when you wake up, you basically feel like someone is digging a shovel into both shoulders and you are freezing cold. The other method the German doctor uses is the application of an adhesion barrier called Spraygel. During surgery, this blue gel is applied to the areas where adhesions were removed in order to prevent new ones from growing. Spraygel works- it provides a barrier and adhesions cannot reform! And they form very quickly- within 7 days! On day 7 or 8, the doctor goes in for a second look at which time more adhesiolysis is performed if needed along with a second coat of Spray Gel. The trip is 14 days and the surgery is 8500 euros, roughly $12,500 USD at today's exchange rate. The success rate of this surgery is 90%! Now those are some odds I can bank on!Here is where my insurance fails- they will not pay for surgery outside of the US and they will not pay for surgery they consider "experimental". Neither SprayGel or Abdolift are FDA approved. When US doctors tested Spraygel for FDA approval, they did it with CO2 gas- no wonder it failed to produce results! Germany is far more advanced in this arena than the US is and this doctor is currently my only hope in getting better-PER MY DOCTOR!We have looked into borrowing the lump sum of money which was not approved. We do not have enough equity in our home (only been here 3 years) and the doctor does not accept credit cards- kind of a good thing when you consider the interest rate. We do not have enough in retirement to borrow against our 401k. I have looked for clinical trials that I might be part of, however there are none that apply. I have looked into buying another insurance policy that would cover even a portion of the expenses, however it was quickly apparent that this was not possible or feasible. I am trying to say that I have looked at as many options as I can think of- and I feel I have exhausted them all. I am feeling pretty hopeless in figuring out how I will find $12k and that does not include airfare or expense for my husband to join me, either! Of course, I would travel alone even though it is highly unappealing to me to be sick in a foreign country- alone. If we could figure a way to fund even a portion of the expenses, we would be in a more realistic spot to afford this surgery. Right now, $12k is simply out of reach.I found this page through referral and thought I would give it a whirl. Perhaps there is a donor out there who knows about chronic illness firsthand and the effect it has on not only the sufferer, but also the family. Perhaps there is a donor who knows how it feels to have the infertility bomb dropped on them. I know it is silly, but I have been playing the lottery ($3 a week) trying to win some money so that I could help others in this situation- and if I ever win it, that is exactly what I would do, too. When you go for surgery, adhesions are not even talked about as being a risk! It is surprising how few people are even aware of adhesion related disorders. Increasing awareness and pushing for research on new methods are key to helping others get well. I spent the past 7 years being misdiagnosed over and over until a doctor finally decided to look inside my body for endometriosis (I have none, another misdiagnosis!) but even he did not talk to me about the potential of adhesions until after he found them! It is a horrible shame that an answer for adhesion pain exists, but insurance companies in the US are unwilling to provide the vehicle to wellness. I cannot understand why there is secrecy around adhesions amongst the medical community. Very little progress is being made in our country even though there are many sufferers who are told daily that there is no cure for adhesions, their pain, their infertility. The current treatment standard in the US is is also the cause. There clearly is an answer through Abdolift and Spraygel. A 90% success rate. It does not make sense that this procedure is not offered in the US, but it seems a lot in our world really doesn't make sense either.Thank you for reading and considering my situation for donation. I am perfectly willing to answer more questions or for your donation to go directly to the doctor, though I could not possibly imagine using money for anything else. I am chronically ill, I am in pain and I am out of answers. Pick up the phone and spend as much time as you did on this site to see if Kruschinski is legit. He has conned greater minds than yours. IHRT still has more breaking news coming in...and lots of it. Click to view the 1st of many. have longthink abot doing this. No no oter possibility for mee. 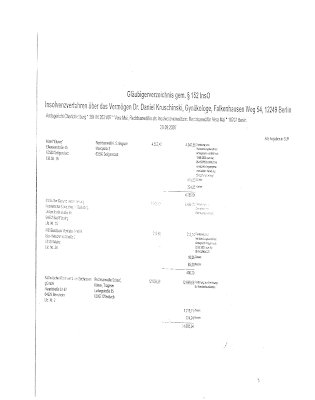 Dr. Kruschinski hasdestroied husband job and my health harmed. He lied Klinik Rottal Munster fierdDr. Kruschinski because of horrible mess, and not what he wrote onmessageboard. If want to learn more please make call to Klinik.Horrible myhusband recommended Dr. Kruschinski, and this why my husband lost job. Dr.Kruschinski says he only wants to help, but this is ly he only wants money anddoes many harm. He not has scrouples and is no god to his family.I underwentsurgical to, and regred it for ever. No studies exist, just trick for monneytaking. Gel does not help. I trusted promises and got lied. Only expensive Heis very good in tricking people out, long much experience. My men wanted his salarybut Dr. Kruschinski was very lubricious. Veery drunken and so mean. I know thathe says I am sick and lie, now he was at help your self group, wit other sickpeople. After red this on this I choosen to make my stori official.I onli canwarn and do not trust Dr. Kruschinski and not to woman Mrs. Miltenberger. Sheblind is and not know that she is instrument like I was. She used by him to.Man work 1 year for Dr. Kruschinski, only drudgeand got nothing thank you. Endogyn trick only to get bugs and health ruined. Toprov I not sick mental I document public made.Dr. Kruschinski doing everything healthruin and money from you.I know Dr.Kruschinski love patient foreigner from while pay more as German people. Have madebecause automatic translation. IHRT applaudes your bravery and hope you join the many involved in his lawsuits to get your money back.....a small consolation for your life of suffering. God Bless and keep you and you are not alone. 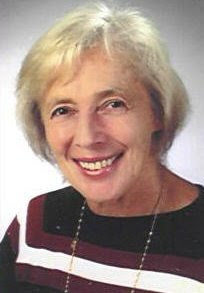 Is Adhibit and Sprayshield compomised due to false information submitted by it's principal investigator, Professor Dr. Liselotte Mettler - Kiel Germany ? Just as Spraygel was dubunked? Is this the face of someone you can trust? IHRT would still like to know how these products are getting European CE marks? IHRT presents indisputable evidence that Mettler and Kruschinski, and others, KNEW that every adhesiolysis procedure performed as a gas-less laparoscopy by him, and "HIS" Abdolift at "The Institute of Endoscopic Surgery aka Endogyn" were in fact EXPERIMENTS! Gas-less procedures that were performed on ALL ARD patients to Endogyn were NEVER a part of any bonifide organized clinical studies under the auspices of authorized standards or medical authorities, statistics and material coming out of Endogyn were NEVER considered studies let alone "clinical studies," anything at Endogyn was NEVER monitored by any medical organizations or authorities, any procedures done via Endogyn were NEVER performed using organized, authorized protocol, any and all "statistics" coming out of Endogyn were NEVER based on true and factual information, there was NEVER any consistent, useful or productive follow-up information regarding any surgeries coming out of Endogyn, let alone any honest information or material, and last, but not least, proof that these two, and others were 100% guilty of unethical behaviors at Endogyn also lies in the fact that...ALL patients were charged for their surgeries, which is against "clinical study" protocol, in Germany no different then in any other civilized country.... the end means of all this is that ALL adhesiolysis gas-less procedures performed with the Abdolift at Endogyn were nothing more then HUMAN EXPERIMENTS! It appears that Mettler and Kruschinski, and others, did not care what happened to patients undergoing surgery at "Endogyn," as they KNEW they were performing operations that were not considered as anything but useless crap, and this we can prove as fact! What is easy for IHRT to surmise about Mettler and Kruschinski, this being based on the number of operations performed by them and the means by which they harvested patients to those surgeries, is that they were more interested in seeing what they might be able to come up with during those surgeries rather then what was best for the patients having those surgeries! When one considers that they had no clue as to what the "might" discover in these surgeries is nothing short of mind boggling! IHRT would be hard pressed to think that their focus was simply to stumble upon "something" that might etch their names in medical history, or perhaps find a "cure" for "something" before someone else did, even if it meant NOT taking into consideration ethical, compassionate, honest, moral and heaven forbid, human rights! In all honesty, IHRT thinks it was for monetary gain and for no other reason! The deplorable physical conditions MOST patients were left in when they came out of an Endogyn operating room leaves one with the impression that the patients were the least interest of these two surgeons...not only did they get your money, they threw you away, fudged their "statistics" and moved on to others to butcher for their gain and pressuring patients to help them accomplish that gain! And that gain was for only one thing...MONEY! YOU’RE MONEY! What is really interesting is that any "statistics" presented anywhere, paid magazines or otherwise, were so poorly "fudged" that they were good for nothing! Most adhesion statistics "researched or gathered" by Endogyn were found ONLY within the Endogyn web site itself, or in papers created by someone associated with Endogyn and put out on the Internet. Interesting enough is that 99% of International ARD research, as well as many OB/GYN Congress's and organizations can be traced back to, YUP.... Mettler and Kruschinski! The ISGE, OB/GYN.net, etc...and all claims of ARD issues coming out of Mexico, Russia and throughout Europe and most certainly out of India can be traced back to these two! Are we then to assume that 99% of what is read on the ISGE and OB/GYN web sites is 99% bogus? Are we to assume that 99% of what we hear from the surgeons and companies that have aligned themselves with Endogyn, aka Mettler and Kruschinski, are as aware of these facts as IHRT is? Are we to assume that they too are 99% "guilty" of being party to harvesting innocent, vulnerable ARD patients to EXPERIMENTAL surgeries at Endogyn? Why do they continue to sponsor organizations like the ISGE who remain tight with surgeons associated with Endogyn, even after Endogyn, Kruschinski, Homberg and others were proven to have taken part in fraud and patient abuse!Perhaps it is all about money and profit as when it comes to anything even remotely related to the issues of adhesions, ARD and those afflicted with it, as little help has come to us from any medical, business or social arena associated with ARD. Is the ISGE really a functional organization or is it a "front" for physicians to take trips all over the world to party and stroke each others egos and performing surgeries that they can no longer perform in their own countries? A smoozing bunch of lying and non productive Ob/Gyn's all tied to Mettler and Kruschinski, who will "tattle" on them at a drop of a scalpel!! Oh well, what's a kidney lost here and there, after all we do have two of them! The Storz Company..... Did the Storz Co. look the other way and take part in this cover-up so that the Abdolift would be seen as something more then a "butchering" hook that caused adhesions? IHRT knows for a fact that the Storz Co. in CA was contacted well prior to 2006 and these concerns were discussed with them, to no avail! Perhaps they thought that if the world did not find out about the injuries resulting from the Abdolift they would sell more of them? Perhaps they didn't care who found out anything about anything regarding the Abdolift, as when Kruschinski and Mettler cornered the market in India, who would care what happened to the poor destitute people there. Perhaps Mrs. Storz was taken advantage by those wanting her sponsorship, as well as some leading employees, perhaps! IHRT knew the Abdolift was being abused by Kruschinski and Mettler as it was not being used as stipulated by their company, yet the Storz Co. stood by and kept quiet! Why? Why do they continue to sponsor organizations like the ISGE who remain tight with surgeons associated with Endogyn, even after Endogyn, Kruschinski, Homberg and others were proven to have taken part in fraud and patient abuse! Perhaps it is all about money and profit as when it comes to anything even remotely related to the issues of adhesions, ARD and those afflcited with it, as little help has come to us from any medical, bussiness or social arena associated with ARD. What has any ARD patient throughout the world reaped from the ISGE other then it's promotion of EXPERIMENTAL surgeries by Mettler and Kruschinski? The answer: NOTHING! Not one medical organization in the world considers anything coming out of Endogyn, or surgeons and facilities associated with it to be anything but a joke! Something to be "ashamed" of! Endogyn, an "Institute" created in the mind of a psychotic nut and filled with false, unusable crap and presented to the world through a website filled with people boasting "titles" before their names when in reality they could not hold a candle to those who have earned such titles. (Remember when Kruschinski put the title "Professor" before his name in the Zuckerberg web site, but pulled it as soon as that scam was discovered and exposed by Endogyn "spys, and when Shirli Homberg "created," falsified and lied about an "Adhesion" lab in which SHE was making more discoveries about adhesion intervention faster then all the researchers combined throughout the world wide! (Patients even bought that crap!) Wow, do these people KNOW what group of patients to target or what! Emotional outbursts from a cult like following of people and patients, who fall away one by one and are not well either! Patients pictures being presented as "validation" of surgeries performed in 4 star facilities without telephones, computers and in which patients have to bring their own DVD's and then donate them to the facility!! What a way for some of these surgeons to retire! Way to go Docs, you've been trashed by Endogyn and you deserve it! Endogyn LTD is nothing more then an elaborate website built to reflect what is not real, and never was..Endogyn's boasting of being an "Institute" was quickly removed when it was exposed as anything but! Numbers and more numbers of patients rushing to get to this "miracle worker and his staff," had their private lives smeared all over the Internet in what was nothing more then a bogus website! These things, and more, appear to be in direct defiance of the ethics and moral characteristic of your trusted physician, as patients were called names and harassed as being Internet" trolls if they so much as mentioned not being well following surgery with "King Kru!" Patients were told that as "women" they will just have to suffer, and this profound message was delivered to them by the 17 year old son of Kruschinski - who posted over and over again medical advice under the name Gucci. List after list of "physician associates," to Endogyn along with a continual stream of NEW infrastructures world wide were always popping up in the Endogyn web site, yet both physicians and facilities alike fell like dominoes tumbling one another! Over and over again names and places appeared in Endogyn and were soon found out to be from an endless pool of "unsuspecting people and facilities" who had no knowledge that they were now tagged as being part of "Endogyn" Everyone and everything that even came close to the words "Endogyn, Kruschinski or Mettler" became entwined in a snare created to scam the world and it did, for a while that is! As we close out the year 2007 and four years of IHRT bringing the facts to light surrounding Endogyn, Kruschinski, Mettler and many, many more names you can find in IHRT, in the end, everything Endogyn tried to "accomplish" was for naught! You, the reader, draw your own conclusions from the FACTUAL information shared below as IHRT presents for your consideration, and well being, the harvesting of innocent patients by Mettler as she begs them to have operations at an already defunct and desperate Endogyn! Ask yourselves if Mettler's words to these desperate patients were out of compassion for them, or maybe out of fear of her being blackmailed by Kru if she didn't get patients to him, or for money, as it most certainly was not because she really thought that they might get well, not at all, as where she was sending them was straight to a living Hell! Also recognize how the fraudulent material on ARD as presented by Mettler and her bunch, was "considered" by the Australian government and caused them to lose interest in a most promising adhesion barrier, - Confluent Spraygel! Thanks to the likes of "Kruschinski and Mettler" and their bunch, IHRT suspects how this barrier will be judged by the world! Let’s see if the "New ISGE President Peter Maher" (the 'ol douche bag of Australia) has any influence over this decision....and IHRT is already monitoring this! And may all who are so deserving find IHRT to be their worst nightmare in the coming year and may you be as poor and in ill health as the patients you sent to Endogyn. May 2008 be as productive for IHRT as these past years have been! We have just begun to fight this war against Endogyn, and will continue to bring to you the truth of "Endogyn" happenings! question Katharina, 27 years dear expert team, forwards approx.. me the blind intestine was removed for 2.5 years. The operating surgeon communicated to me after the OI, he additionally two Endometrioseherde would have removed. To my question, which that was, it did not answer with "anything bad". I did not receive further information. In the meantime I am the OI not really well smart unfortunately ran, a scar caught fire. Nevertheless I became with large pain to dismiss. I became four days later then (in another hospital!) again operates. The entire peritoneum had caught fire. The scar had to zuheilen from the inside out. Since that time I have strong pain, as soon as I harness belly muscles. Since I suffer from recovery weakness, that would be the only way to come again into my trousers. In addition it is extreme bloed to be able to drive no sport. I am tried to let me operate again white in addition, that the danger of renewed growing together is large. My question would now be, how you think of it? And thereby are the earlier cuts used? Does it have to zuheilen again from the inside out? Already times a belly reflection had, with all this problem-free ran and had thereafter never complaints with the scars before mentioned OI. Could you recommend a hospital to me? I live at present in Emden. Here comes the laugh of 2007! ~~~~~~~~~~~~~~~~~~ So much for Karen Steward's book about "Kruschinski, Endogyn, the Abdolift and Confluent Spraygel!" Capitalizing on others misfortunes isn't what you thought it would be, right Karen! Your book just got crapped on, BIG TIME! Now ya'al just giddy up there you little filly and read! Lets hear it for Karen AND Helen, the two most deserving people to be flushed down the toilet by King Kru!!" DISCLAIMER: This report is based on information available at the time of research and cannot be expected to cover any developments arising from subsequent improvements to health technologies. This report is based on a limited literature search and is not a definitive statement on the safety, effectiveness or cost-effectiveness of the health technology covered. The Commonwealth does not guarantee the accuracy, currency or completeness of the information in this report. This report is not intended to be used as medical advice and it is not intended to be used to diagnose, treat, cure or prevent any disease, nor should it be used for therapeutic purposes or as a substitute for a health professional's advice. The Commonwealth does not accept any liability for any injury, loss or damage incurred by use of or reliance on the information. The production of this Horizon scanning prioritising summary was overseen by the Health Policy Advisory Committee on Technology (HealthPACT), a sub-committee of the Medical Services Advisory Committee (MSAC). HealthPACT comprises representatives from health departments in all states and territories, the Australia and New Zealand governments; MSAC and ASERNIP-S. The Australian Health Ministers’ Advisory Council (AHMAC) supports HealthPACT through funding. This Horizon scanning prioritising summary was prepared by Mr. Luis Zamora from the Australian Safety and Efficacy Register of New Interventional Procedures – Surgical (ASERNIP-S). SprayGel® is a new adhesion prevention system developed for use intra-operatively. SprayGel has shown to provide some prevention in adhesion formation in ovarian surgery patients without major adverse events. The system is currently available in Australia and New Zealand. Adhesions (also called pelvic adhesions, intraperitoneal adhesions) are abnormal scar-like bands that form between two surfaces inside the body. Their formation can be a result of peritoneal damage, intra-abdominal ischemia or the presence of foreign materials in the abdominal cavity (e.g. surgical glove powder, micro-organisms, gauze lint, sutures and prosthetic mesh) (Mettler et al. 2002). Adhesions can range in severity from, thin film-like bands to thick fibrous bands. Although adhesions are not associated with specific symptoms, people with adhesions may experience pain (resulting from the pulling of nerves at the site of adhesions), intestinal obstruction, infertility and increased rate of complications during subsequent surgeries (Ellis et al. 1999). Adhesions can occur anywhere within the peritoneal cavities. There are several causes of adhesion formation including endometriosis, attacks of appendicitis and pelvic inflammatory disease. However the most common cause of adhesion formation is surgery (Johns et al. 2003). Treatment of adhesions involves the cutting or releasing of the adhesions through a process called adhesiolysis, a procedure which can be performed via laparoscopy or laparotomy (Szomstein et al. 2006). The surgery is performed to allow normal movement of the affected organs. Unfortunately, even after adhesiolysis has been performed up to two-thirds of patients will experience recurrence (Mettler et al. 2002). Given that even adhesiolysis surgery can cause adhesion formation, surgeons use various surgical techniques in an attempt to prevent adhesion formation. These include: avoidance of the introduction of foreign bodies into the cavity (e.g. surgical glove powder), limiting unnecessary handling of organs, avoiding the use of dry sponges and irrigating the cavity during the surgical procedure, avoiding unnecessary damage to organs, tissues and blood vessels, and using the finest size suture thread appropriate to the surgery. The SprayGel adhesion barrier system is designed to minimise adhesion formation and consists of two separate polyethylene glycol (PEG) based liquids that when mixed together (upon application) quickly cross-link to form a biocompatible flexible, absorbable hydrogel in situ. The SprayGel component liquids are sprayed onto the target tissue(s) with an air-assisted sprayer which can be used in either endoscopic or open procedures. SprayGel remains intact for five to seven days preventing fibrin deposition and fibrinolysis and after which it breaks down into water-soluble PEG components that undergo renal clearance. It has been reported that adhesions occur in 68% to 100% of patients who have undergone one or more laparotomies (Ellis 1997, Luijendijk et al. 1996, Menzies and Ellis 1990). Previous abdominal surgery has been described as the single most important predictive factor of adhesion formation (Szomstein et al. 2006). Adhesions can have severe implications for sufferers. Sufferers of abdominal adhesions can suffer chronic abdominal pain as well as develop small bowel obstructions. Female sufferers of pelvic adhesions (involving the uterus, ovaries, fallopian tubes or bladder) may develop reproductive complications including infertility and ectopic pregnancy. Finally, sufferers of heart adhesions may suffer from decreased heart efficiency. Unfortunately, the majority of adhesion barriers and agents used for prevention of adhesion formation are difficult to use in open surgery settings and even more difficult under laparoscopic surgery settings (Mettler et al. 2002). The SprayGel adhesion barrier is currently not approved for sale in the United States. The barrier has received CE Mark and is available in the European community. The system is also available in Australia, New Zealand, South Africa, UAE, Oman, Qatar, Bahrain, Israel, Saudi Arabia and Lebanon. The extent of diffusion of the SprayGel adhesion barrier in Australia was not revealed in the searches conducted. Various barriers have been evaluated to reduce or prevent adhesion formation. However, many are difficult apply under laparoscopic conditions, have unsuitable absorption times or are associated with increased adverse events (Mettler et al. 2004). The first clinical evaluation of SprayGel was conducted as a multi-centre study investigating the safety and effectiveness of the barrier in women undergoing open or laparoscopic myomectomy procedures. Three publications reporting results from the same study were retrieved in the literature search (Mettler et al. 2003a, Mettler et al. 2003b, Mettler et al. 2004). Only results from the most recent, detailed study are presented (Mettler et al. 2004). In this prospective, randomised, controlled phase III study, patients undergoing open or laparoscopic surgery for leiomyoma or leimyomatous uteri were assigned to receive the SprayGel adhesion barrier plus optimal surgical technique (treatment group) or optimal surgical technique alone (control group). Following myomectomy, patients were randomly allocated to either the treatment or control group. At each site, the first eligible patient was not randomised but instead received treatment with SprayGel to familiarise the investigators with its use (these patients were followed-up for safety analysis only). All patients who received application of the SprayGel barrier had suture lines and all potentially adhesiogenic surfaces on the uterus and adjacent structures coated to a thickness of approximately 0.5 mm to 1.0 mm. Of the 69 women enrolled, five did not proceed to randomisation (two training patients and three study withdrawals). Therefore, 64 were included in the efficacy evaluation (34 treatment and 30 control group patients) and 66 in the safety evaluation (including the two training patients). The uterine myomectomy procedure and thus application of the SprayGel barrier was performed laparoscopically in 28 (82.4%) of treatment and 23 (76.7%) of control patients. The authors noted that application of the SprayGel barrier was easy in both laparoscopic and open procedures with mean time of application of 3.7 minutes and average requirement of 1.9 kits per treatment patient. There were no adverse events related to the use of the SprayGel barrier. The primary efficacy outcomes were incidence1, severity2 and extent3 of adhesions measured at the second look laparoscopy (SLL), which was performed between three and 16 weeks after surgery. Twenty-two (64.7%) treatment and 18 (60%) control group patients returned for SLL. Despite the high attrition rates, no significant differences between patients who returned and those who did not were found. Prior to surgery, patients in both groups had similar incidence, severity and extent of adhesions. At the SLL there were no significant differences between groups in regards to extent of adhesions with both groups having similar median areas of the uterus covered with adhesions (p > 0.1). Although treatment patients experienced lower incidence than control patients (31.8% versus 11.1% adhesion free, respectively), no statistically significant difference was observed. Treatment group patients experienced significantly lower severity as shown by a lower mean tenacity score than the control group (1.0 versus 1.9, p = 0.002). In terms of recurrent adhesions, no statistical difference between the two groups was reported. Comparison of SLL to initial myomectomy values revealed patients who did not receive SprayGel were at an increased risk of forming adhesions compared to patients in the treatment group, demonstrated by increased incidence of adhesions (0.64 for treatment versus 1.22 for control, p = 0.035). Similarly, severity at the SLL was significantly lower for treatment group patients than at the initial surgery compared to control group patients (0.6 for treatment versus 1.7 for control, p = 0.001). No statistically significant difference in the extent of adhesion was noted with both groups having similar increase in the adhesion area from initial surgery to SLL (4.5 cm2 for treatment versus 7.2 cm2 for control, p > 0.1). Johns and colleagues conducted another randomised controlled trial of the SprayGel adhesion barrier to investigate its impact on frequency of adhesion formation and reformation after ovarian surgery (Johns et al. 2003). In this study 14 women undergoing laparoscopic ovarian surgery were randomised to have one ovary treated with SprayGel and the other with good surgical technique only. Patients who received the SprayGel treatment had the barrier applied to the entire surface of the relevant ovary and immediately adjacent structures with the air-assisted applicator. No SprayGel was applied to any contralateral structures. At the SLL treated ovaries demonstrated a reduction in adhesion formation of 21.4% (p value not reported) and a significantly lower extent of adhesion cover over the treated ovary (control mean extent surface are 52.0%, treated mean extent surface area 29.6% , p = 0.0298). Additionally the mean severity score was lower for the treated ovaries (mean 2.1) than for the control (mean 2.7) ovaries although statistical significance was not reported. The frequency and extent of adhesion formation on ovaries, fallopian tubes and pelvic side walls were also evaluated by an independent reviewer who determined that the change in both frequency and extent between the initial surgery and the SLL were significantly lower in the treated ovary side compared to the control side (p = 0.0488 for frequency and p = 0.0494 for extent). The frequency in the treated sides increased from 3.21 (initial surgery) to 4.21 (SLL) compared to 2.57 (initial surgery) and 6.07 (SLL) for the control side. Similarly extent of adhesions increased from 5.46 cm2 at the initial surgery to 10.97 cm2 at the SLL. No adverse events related to the use of the SprayGel barrier were reported. A search of the published literature and website of the manufacturer of SprayGel (Confluent Surgical Inc., Massachusetts, United States) did not reveal the cost of SprayGel. No issues were identified from the retrieved material. Adhesions present major complications for sufferers. Although adhesiolysis is performed to divide any adhesions present, the technique itself can lead to further adhesion formation. Various surgical techniques and adhesion barriers are available to reduce adhesion formation. Though the evidence suggests that SprayGel is somewhat effective in reducing adhesion formation, there is a lack of studies comparing SprayGel to other adhesion barriers as well as documenting the long term effects of this adhesion barrier. It is recommended that SprayGel be archived in view of the limited evidence and the alternative barriers currently available. Abbott J, Thomson A, Vancaillie T. SprayGel following surgery for Asherman’s syndrome may improve pregnancy outcome. Journal of Obstetrics and Gynaecology 2004; 24(6): 710-711. Kruschinski D, Homburg S, D’Souza F, Campbell P, Reich H. Adhesiolysis in severe and recurrent cases of adhesions related disorder (ARD) – A novel approach utilizing lift (gasless) laparoscopy and SprayGel adhesion barrier. Surgical Technology International 2006; 15:131-139. Mettler L, Audebert A, Lehmann-Willenbrock E, Jacobs V, Schive K. New adhesion prevention concept in gynaecological surgery. Journal of the Society of Laparoendoscopic Surgeons 2003 (a); 7(3): 207-209. Mettler L, Audebert A, Lehmann-Willenbrock E, Schive K, Jacobs V. Prospective clinical trial of SprayGel as a barrier to adhesion formation: An interim analysis. The Journal of the American Association of Gynecologic Laparoscopists 2003 (b); 10(3): 339-344. Mettler always appears where there is ARD "research and money," so is it a wonder why Harry Reich is always saddled to her back? Can anyone trust Mettler's statistics and research? VANCOUVER, BC and TORINO, ITALY, April 7, 2006 – Angiotech Pharmaceuticals, Inc. (NASDAQ: ANPI, TSX: ANP) today announced positive results from its Adhibit™ Adhesion Prevention Gel Myomectomy Study. The final data set was presented today by Dr. Lilo Mettler, the study’s principal investigator, at the 19th Annual European Congress of Obstetrics and Gynecology in Torino, Italy. This randomized, controlled, single-blind, clinical study was designed to evaluate the safety and efficacy of Adhibit in reducing the incidence and severity of post-operative adhesions when applied immediately after the removal of uterine fibroids (myomectomy surgery). The study was conducted at six investigational sites in Europe, Canada, and the Netherlands Antilles. The trial randomized 71 patients, with 48 patients receiving the Adhibit treatment and 23 patients receiving no post-operative adhesion treatment (the Control group). Patients were surgically re-examined eight to ten weeks post-procedure to determine the incidence and severity of adhesions. Adhibit was shown to reduce post-operative adhesion formation as measured by the modified American Fertility Society (mAFS) score, a scoring system that factors in both the extent and tenacity of adhesions. Patients in the group that were treated with Adhibit experienced a statistically significant reduction in their mAFS score when compared with those in the Control group (0.8 ± 2.0 Adhibit group versus 2.6 ± 2.2 Control group; p=0.010). Adhibit is a fully-synthetic, sprayable hydrogel that is safely resorbed by the body over 30 days and is designed to reduce or prevent the formation of post-operative surgical adhesions. Currently approved in Europe to prevent or reduce post-surgical adhesion formation in pediatric patients undergoing cardiac surgery, Adhibit is an Angiotech product that is sold and marketed by Baxter Healthcare Corporation worldwide, excluding the U.S. Baxter has an option to license Adhibit in the U.S.; however, Adhibit is not currently approved for sale in the U.S.